Hard water can cause various problems in your home. It can also cause problems with hair and skin. The elements that are in hard water can clog drains and piping and cause your equipment to run less efficiently than expected. If you find your washing machine or dishwasher is not working as you want, it may be due to the hard water conditions in your home. Having hard water is a problem many people face, especially those who are in the in US, UK and Australia. This problem can be solved by adding a water softener at home. 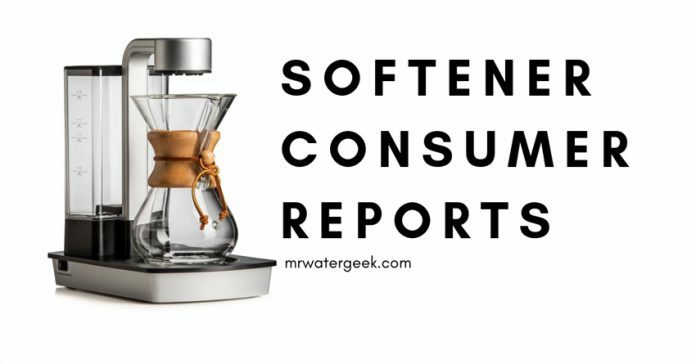 The following article outlines my best water softener consumer reports for the best softeners on the market today. Water softeners eliminate the most common problems that result from using hard water in your home. There are several types, some of which are easier to install than others. Some water softening systems may require some DIY knowledge and others require you to hire a professional plumber to install it for you. However, make sure you understand the warranty position of your softener before trying to do it yourself. This is because some warranties and guarantees will be void if you do it yourself. 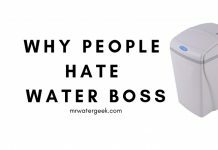 Avoid this issue by always hiring a professional plumber to install your water softener. 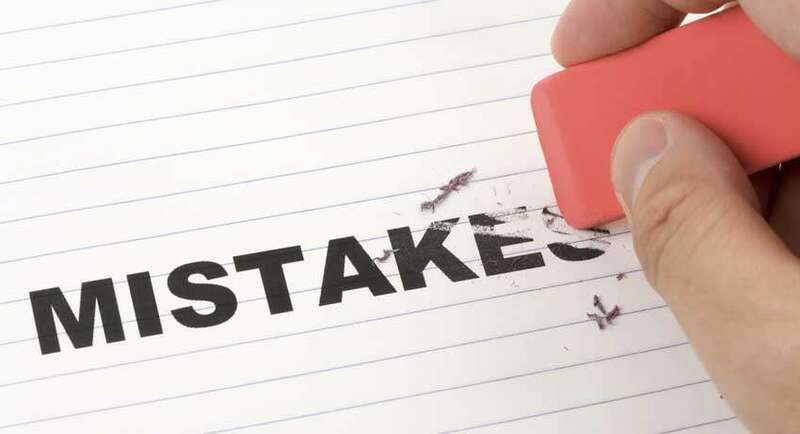 Also, it is important to read the specifications of the water softener before you buy. This will help make sure you buy one that is tailored to your specific needs. Below is a list of the top 4 water softeners according to consumer reports. Yes $$$$ 1-2-Stage Filtration - Removes a hardness of up to 75 gpg. - It has a grain capacity of 64,000. (50% OFF with coupon code: AQGEEK50) 4-stage filteration (with optional add-ons e.g. UV filters). 6 years or 600,000 (1 million) gallons of water. (50% OFF with coupon code: AQGEEK50) 4-stage filteration (with optional add-ons e.g. UV filters). 10 years or 1,000,000 (1 million) gallons of water. 1. ABCwaters Triple Combo Whole House Fleck 5600SXT 48,000 Grain Water Softener System Yes $$$ Carbon filtration. 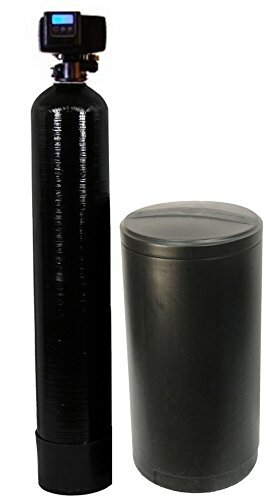 - Carbon filters eliminate up to 96% of contaminants. The water softener and the Iron Filter Iron Pro 2 combination have a high throughput for use throughout the house. This system does not significantly affect the water pressure in your home. But it eliminates many of the most common water pollutants. This water filter and softener system is relatively easy to install compared to other systems. The unit comes with instructions for DIY installation that can help those who have no experience with plumbing projects. It has a grain capacity of 64,000. Equipped with fine mesh resin for maximum iron removal. Also comes with the brine tank and the bypass valve. The installation can be difficult if installed in a house that has never had a water softener before. You may need to adjust the hardness of the device for the best results. As the name suggests, it removes iron, hardness, rust, sand, manganese and much more from your water supply. This means that it is a filter AND softener in one unlike other machines that only do one or the other. It can be used to filter the entire house and have clean water for drinking, cleaning and bathing. The system includes the stain valve to help you work efficiently. Includes a digital metering valve that gives you more efficiency. Comes with a 5 year manufacturer’s warranty. The Aquasana 6 year water filter can filter up to 600,000 gallons of water. This system has a powerful filtration capacity to make your water taste better and more effective when used in other household tasks. This water filter system has no drainage and produces no wastewater. Therefore, it is ideal for those who are looking for an ecological water softener. Includes tank, 10″ filters, couplings and valves for installation. Removes 97 percent of all the chlorine from water at source. It provides better water for healthier skin and hair. Also reduces other pollutants like lead, mercury and pesticides. 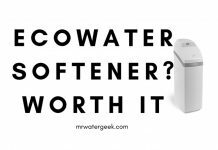 Not technically a water softener as it doesn’t use salt but still produces a lot of the same soft water benefits. Acts as a water softener without salt and also filters your water unlike traditional water softeners. 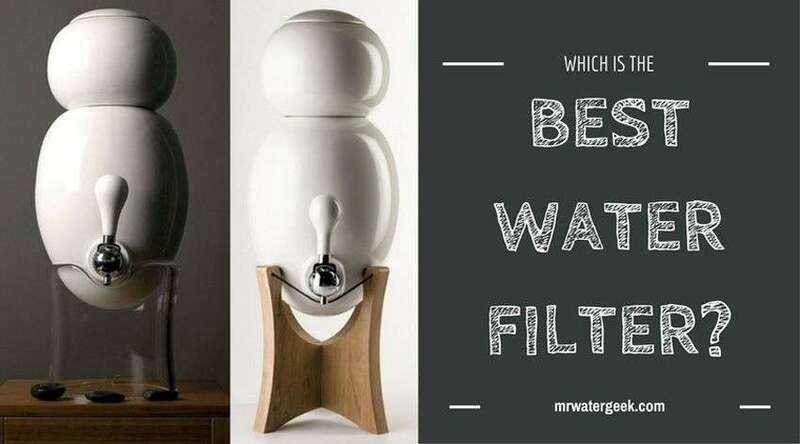 This whole house water filter removes minerals and other contaminants in your water supply. 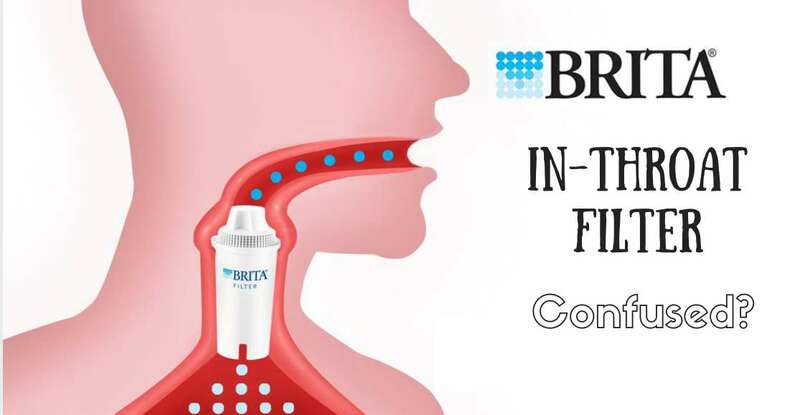 Reduces or eliminates the most common contaminants in the water system for the whole house. The system comes with most of the components required for installation and can be quickly installed out of the box by a professional plumber. Lots of excellent customer reviews and the company is well known for providing good customer service if anything goes wrong. This water filter system has filters that filter 1 million gallons or a 10-year water supply. 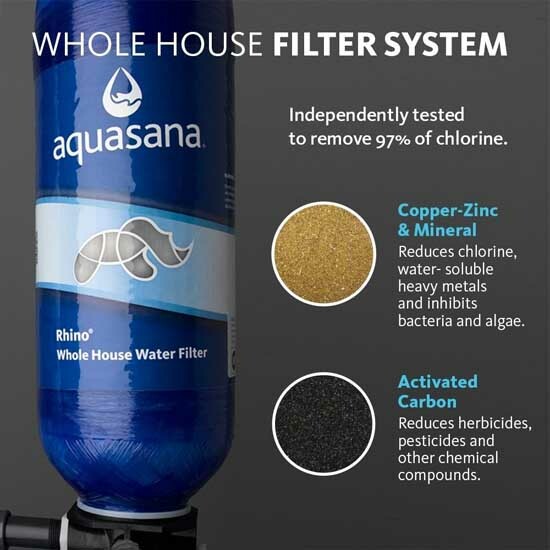 Uniquely, this Aquasana whole house filter includes everything needed for a professional installation. However, the installation of this system is a bit complicated in your home. 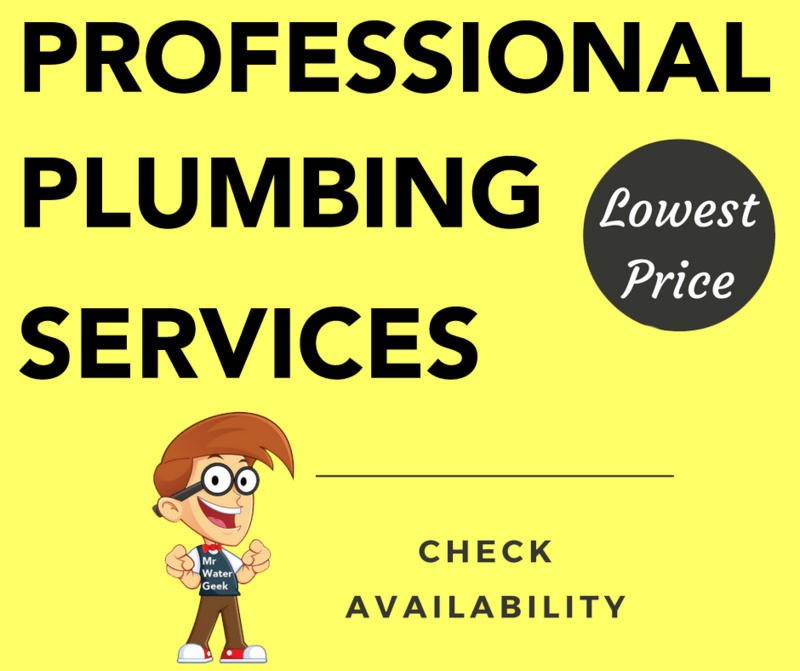 Therefore, you may need to hire a plumber if you are unfamiliar with the plumbing installation. 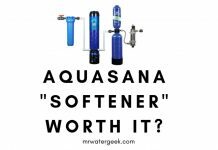 This Aquasana system can remove about 97% of the chlorine in the entire water supply in your home. This can improve the taste of your drinking water and also help prevent your hair and skin from being exposed to excessive chlorine. Comes with entire installation kit. Designed for use with standard .75 inch pipes. The system is not technically a water softener and more of a filter but produces similar quality results to a softener. Provides your whole home with high quality, pure water with low to no maintenance necessary. Includes shut-off valves and accessories. Does not drain out waste water, flush or sewage. This water filtration system has a guaranteed shelf life of about 10 years or 1,000,000 (1 million) gallons of water. High performance, so does not affect the water pressure. 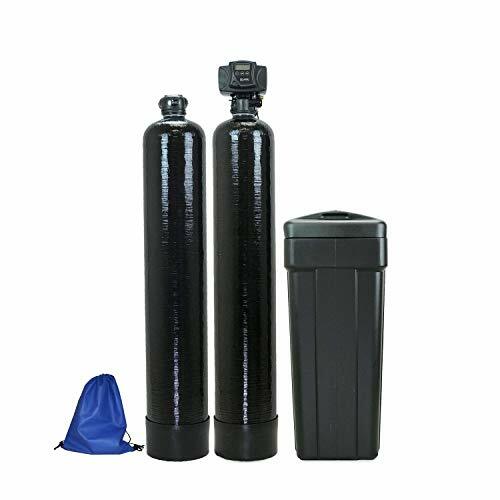 The ABCWaters Triple Combo whole house water softener is a complete water softening system suitable for your entire home. This system contains everything necessary for installation. The package also includes the option of technical support if you need help. This water softening system from ABCwaters uses reverse osmosis to filter and soften water. The 5-stage filtration system has an efficient design that easily removes contaminants from the water to improve the water supply in your home. Best selling filter softener on places like Amazon with raving customer reviews. 5-stage filtration system along with water softening. 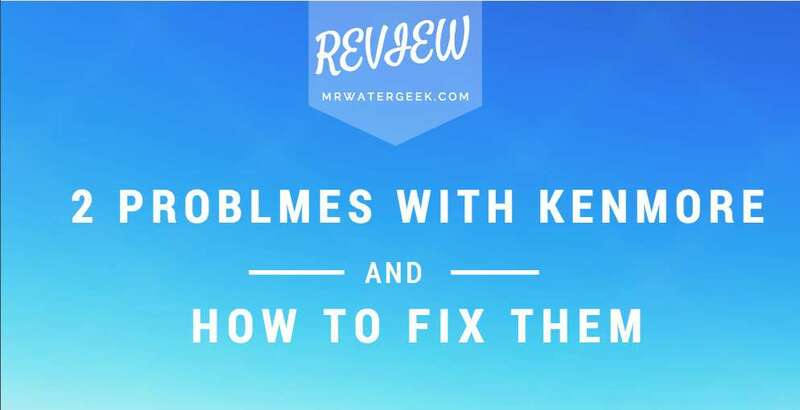 This is by far the most popular home water treatment system so it’s easy to troubleshoot, get manuals and support as there are lots of information online. The package contains everything you need for the installation, this includes both kit and instructions. Designed to filter and soften the water in your entire home. The valves included are guaranteed for 5 years. This system is designed for use in the average family home (i.e. from 2 to 5 people). If you have hard water at home, you probably have problems related to water installations or even concerns about your skin or hair. Hard water can cause your equipment to malfunction because it can accumulate in your dishwasher or in your washing machine. This can cause your dishes to not look completely clean and it can also prevent laundry from being washed properly. Hard water can pollute the bath, shower and accessories and requires intensive cleaning to avoid waste. By installing a high-quality water softening system in your home, you can eliminate these problems. There are several types of systems designed to avoid hard water problems. This best water softener consumer reports shows you the best 4 water systems that filter and soften your water. All of this is based on the most reliable consumer reports. However, I haven’t just told you all the good things, I’ve also highlighted the problems that you must be aware about before you buy. The winner for me is ABCwaters Triple Combo Whole House Fleck 5600SXT. Previous articleDrinking Water pH Health EFFECTS – Do NOT Drink Until You Read This! Hi! 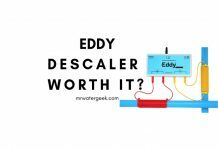 We are new to hard water since we just moved to Minneapolis and the area that we live in has very hard water. We have 2 bathroom that we use regularly and my wife and I live with our child. We want something good that will soften our water and also purify chlorine, and filter out other chemicals. We also use a Berkey for drinking water. If you’re worried about chlorine you should opt for the Aquasana 10-Year Rhino because it removes 97% of chlorine and chloramines (this is among the highest rates of chlorine removal on the market). Add on the Salt-Free Water Softer option to the Aquasana Rhino if you want to reduce hard water issues like limescale. To be clear, this option is a filter first with “softening” capabilities if you add the Salt-Free Water Softener Scale Control Media (SCM) upgrade. However, if hard water is your bigger concern then the ABCwater Triple Combo is better because it’s a softener first with light filtration capabilities but I’m not sure how well it copes with chlorine.